Costco Has 4-Foot-Tall Wine Glasses. Need We Say More? Wine is confusing, even down to the glasses. It feels like you should fill them up to the brim? But it's actually more like halfway? And servers just do a splash sometimes? That's not even mentioning all the confusion about what wine you should buy to actually put in the glass. We have the perfect way to remove all that confusion. The solution is to use one of these absolutely enormous wine glasses from Costco instead. Their size will intimidate anyone into thinking you know a lot about wine -- even if you're serving Two Buck Chuck. You'll also never have to worry about getting up to refill your glass and halting the conversation -- and if the talk does slow a bit, what's a better conversation piece than an impractically tall wine glass? For a mere $99, this glass among glasses will be yours. It towers 46 inches, close to 4 feet, and according to a commenter on the Costco website, will fit at least four bottles of wine. Or a serious amount of liquor. 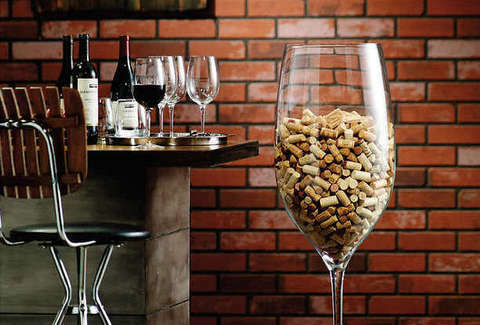 Or you could fill it with corks. Or gourds. Or, yeah, wine.